Strong steel flush-jointed casing for use in conjunction with shell and auger tools threaded to BS 879 (waterwell casing). 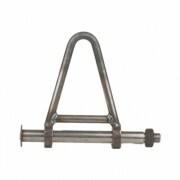 The steel tube is hot-finished seamless, grade ST 52 or API 5L. 4" 4 1/2" 3 7/8" 4"
5" 5 1/2" 4 7/8" 4"
6" 6 5/8" 5 7/8" 4"
8" 8 5/8" 7 7/8" 4"
10" 10 3/4" 9 7/8" 4"
12" 12 3/4" 11 7/8" 4"
18" 18" 16 3/4" 4"
20" 20" 18 3/4" 4"
24" 24" 22 3/4" 4"
Supplied in lengths of 0.75, 1.0, 1.5 and 3.0 m. Other lengths available up to 6m to order. 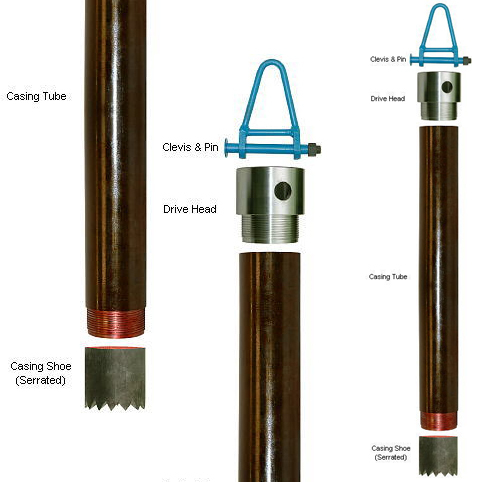 On request, larger diameters can be supplied with a coarser 2 t.p.i. 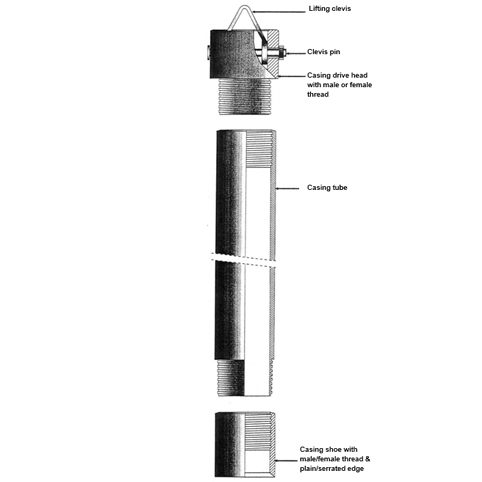 thread form to facilitate rapid coupling and uncoupling. 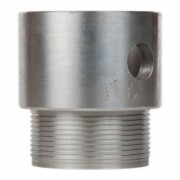 A heavy-duty drive head with 1″ minimum wall thickness. 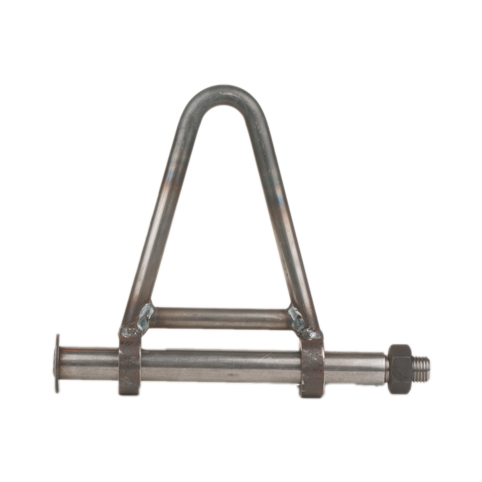 Supplied with cross holes to fit surging bar or clevis and pin. Available with either male or female threads. 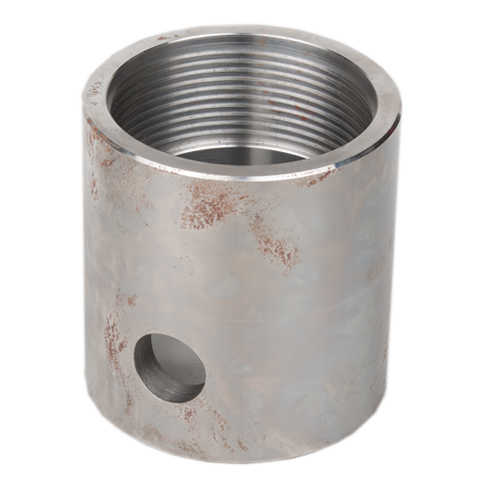 Manufactured from same material as casing with two cross holes. 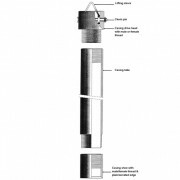 Used only for suspending casing or lowering casing into borehole. 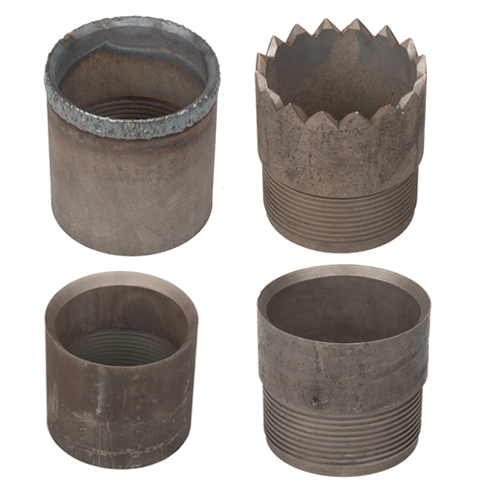 Heat-treated hardened cutting edge or low nitrogen hard-faced weld according to customer preference. Can be supplied with male or female threads and with plain edge (as shown) or serrated cutting edge.